Aerial view of an under-construction solar farm in Brunswick, Maine. The PUC’s recent solar ruling would maintain an arbitrary cap on community solar farm memberships to 9 members, hampering job creation and access to solar energy. Creates new production tax “behind the meter” solar production!!! Even with the benefit of several months to reconsider their initial ruling, the PUC has decided to issue an un-implementable, ‘judgment with no trial’ indictment of solar that ignores their own data showing that solar adds tremendous value to the grid and that utility customers should be able to benefit from this value. The relatively short period of time for grandfathering – 15 years – is/was the worst in the nation (worse even than Nevada, who after initially suspending net metering for all customers, restored it for 20 years). Currently, neither the grid nor the utility accounts see solar that gets consumed in real-time at a solar site. This makes sense; any solar production you consume at your own location is your own business, and not subject to oversight from the utility companies. Much like utilities do not get insight as to when you install or remove a hot tub, or electric heat, or upgrade your fridge, they have no right to know how the solar you install affects on-site production. Except, in the PUC rules this would be the case, and the PUC would have utilities start tracking how much total solar power is generated on site and starting to charge solar customers transmission & distribution rates for the power that gets consumed on site! This new tax on solar would cause solar customers to start paying grid usage “tax” on the power they produce and consume without even using the grid. The new rules make it clear that it’s Maine’s legislature that should be doing the important job of defining solar policy, and not the un-elected 3-person Public Utilities Commissioners. What Does This Mean for Solar in Maine? If you already have solar net metering or start net metering in 2017 – You will be grandfathered in for 15 years. If you are a new solar customer (starting 2018 onward) – You will receive a smaller benefit for the Transmission & Delivery (T&D) part of your solar bill for the life of the system. The rules would have T&D benefits drop by 10% per year, each year, over 10 years, until the T&D portion of the benefit is 0. Importantly, the year that you sign up for net metering, you would be locked into the benefit in place at that time (e.g. your benefit does not decrease over time). While this does not significantly affect solar economics (since the efficiency and cost of panels will be decreasing over this time period) it still moves solar policy in the wrong direction. Maine can, and should, do better with solar policy, and we will be working with our network of solar allies – politicians from all parties (and unaffiliated), business leaders, faith leaders, communities, environmental groups, institutions of education, solar customers, would-like-to-be solar customers, and all members of the public who want the strong benefits of solar for Maine to be realized. The legislature is considering several solar policy bills this session (Spring 2017), which could reverse changes made by the PUC and hopefully improve things for solar. At this point, it is unclear which bill(s) will make it to the floor and whether we will want to support them. We have fought tirelessly for comprehensive solar policy in Maine, failing in the last session to override the Governor’s veto by only 2 votes. 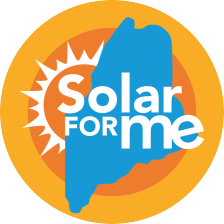 We are confident that Maine’s Legislature can do the right thing for solar, and we will work to make the facts clear despite ongoing campaigns of misinformation and bullying on the side of anti-solar advocates. Why Does Maine Need Solar? Here are some solar facts we encourage you to share around! Every year Mainers export $5 billion from the local economy to import fossil fuels from away. By investing in local solar infrastructure, we create good-paying jobs for Mainers, we keep our money in the local economy and we increase our energy security. Maine is dead last in New England in terms of solar energy adoption, and we have the highest per capita fossil fuel consumption and carbon emissions in the region. We are the only state in New England without a strong solar policy to encourage investments. We need a pro-solar policy to unleash industry job creation–in Massachusetts, there are 10,000 solar industry workers compared to 300 in Maine. The cost to install solar has dropped by more than 70% over the last 10 years, creating a practical investment opportunity for all Mainers who want to save money and protect Maine’s pristine natural environment. But Mainers are holding off on these investments due to lack of clear policy signals out of Augusta for the past six years. Maine has an abundant solar resource that can be harnessed to save money and reduce pollution, producing both economic and environmental benefits for all Mainers.Every year Maine gets 30% more sunshine than Germany, a world leader in solar adoption–in fact, Maine’s annual solar generation potential is equal to Houston, TX, thanks to an abundance of cold, clear days which allow solar arrays to produce their peak harvest. Solar in Maine means jobs and lower electricity rates for all utility ratepayers. Despite direct orders from the legislature to develop a policy to accelerate distributed solar in Maine, the PUC is instead proposing to weaken solar net energy metering, which will slow the growth of solar in Maine. The PUC is also ignoring its own Value of Solar study which clearly shows that solar benefits all ratepayers, whether they have solar on their roof or not. The proposal clearly advances the interests of utility shareholders rather than maximizing the ratepayer benefits of solar. Since the PUC has proven unable to put facts and data ahead of utility interests, I urge the legislature to fulfill its obligation to develop a solar policy that will accelerate distributed generation, create jobs for Mainers and produce financial savings for all ratepayers. The Commission should be promoting new solar, like all of our neighboring states do. Solar means new jobs for Maine, lower energy costs for Maine, and new economic opportunity. It’s time for the LePage administration to either start leading or get out of the way. How can it be, that someone going solar to save themselves money, actually helps saves everyone money? There are several ways solar benefits everyone (cleaner air, clean jobs) but the least well understood may be how solar reduces expensive electric grid peaks..
ISO New England graphic showing how solar (mainly in Massachusetts) helps reduce grid dependency during a sunny day. There is a ‘duck’ curve towards the end of the day which can be offset with battery storage or energy efficiency measures. One major reason our electricity rates are high is because utilities get approval to build expensive transmission lines to meet electricity needs on peak summer days; this increases electric rates year-round. On these “peak days”, power companies must run the most expensive power plants—such as the oil-burning power plant on Cousin’s Island in Yarmouth— which charge very high rates for power during these times. They also pollute the most. Distributed solar power, on rooftops or in larger arrays, provides a powerful, proven, quantifiable way to reduce these costs for all electricity consumers. Maine’s existing solar installations save money for all ratepayers: $2.5 million/year plus environmental benefits and job creation. We can save even more if we move Maine forward on solar. If Maine had 250 MW of solar – the amount called for in last session’s solar bill, LD 1649 – ratepayers would save $30 million every year for 25 years, not including any of the tremendous environmental or job creation benefits. Over 25 years, 250 MW of solar would reduce the costs of transmission & distribution lines borne by all Maine ratepayers by $170 million. The electricity grid is a complicated thing, with a lot of big powerful players. But solar power is power from the people: the benefits from solar that we all share come from thousands of ordinary Mainers who invested in solar for their home or business.